Yes, the show you most wish was a documentary is heading to Goodgod Trivia, so bust out the box set and your best grey pantsuit, and don’t have a non-perambulatory conversation for the next three weeks! You know the drill. Drink specials, prizes, and giggles. 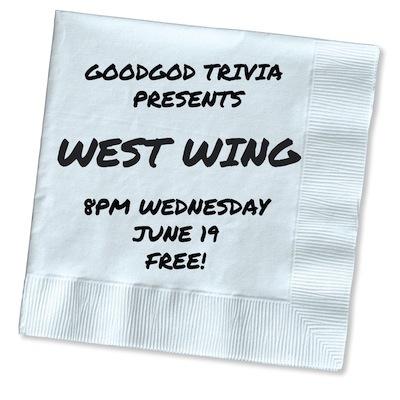 Come and celebrate a world where politics isn’t depressing, nobody uses one word where twelve will do, and Aaron Sorkin still had credibility to burn. Booking is essential, and available through The Dip on (02) 9283 8792 / do@thedip.com.au.